Selumetinib in Combination With Dacarbazine in Patients With Metastatic Uveal Melanoma: A Phase III, Multicenter, Randomized Trial (SUMIT). In patients with metastatic uveal melanoma, the combination of selumetinib plus dacarbazine had a tolerable safety profile but did not significantly improve PFS compared with placebo plus dacarbazine. Targeted therapy, acts by inhibiting specific molecules that are important for tumour growth, to stop cancer proliferation. Since uveal melanoma is characterized by mutations in GNAQ or GNA11, which lead to activation of tumour proliferation, therapies that target molecules produced by this mutations (such as MEK, Akt and protein kinase C) are being investigated. Selumetinib (potent and highly selective inhibitors of MEK) is one of these molecules. The Selumetinib in Metastatic Uveal Melanoma (SUMIT) study was a phase III, double-blind trial ( ClinicalTrial.gov identifier: NCT01974752) in which patients with metastatic uveal melanoma and no prior systemic therapy were randomly assigned (3:1) to selumetinib (75 mg twice daily) plus dacarbazine (1,000 mg/m2 intravenously on day 1 of every 21-day cycle) or placebo plus dacarbazine. The primary end point was progression-free survival (PFS) by blinded independent central radiologic review. Secondary end points included overall survival and objective response rate. 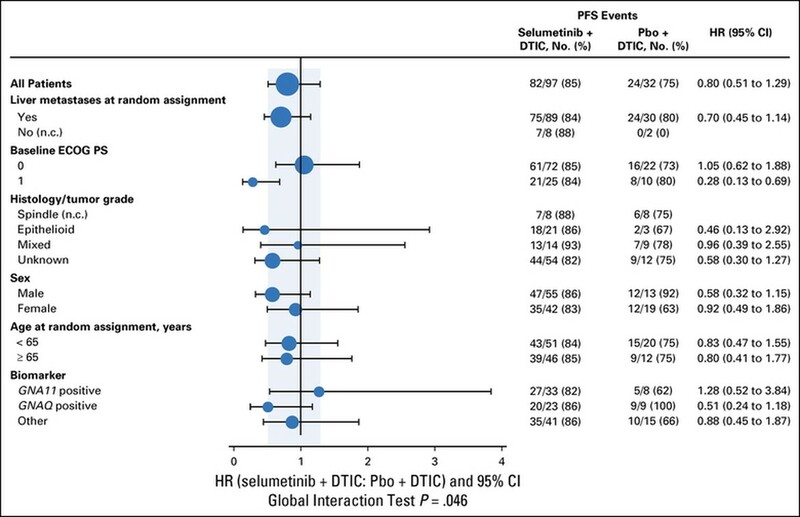 In patients with metastatic uveal melanoma, the combination of selumetinib plus dacarbazine had a tolerable safety profile but, unfortunately did not significantly improved PFS compared with placebo plus dacarbazine.